People who want to know the difference between C and JS apps, or just want to get started with an overview of the Pebble.js API. I am not a Pebble.js master developer. At the time of this writing, I have written one Pebble.js app and published it on the app store. I just want to share my experience to make it easy for other beginners and perhaps clear out a few things that I had to dig around and learn. This article is intended to be a deeper overview of Pebble.js and meant to complement the information in the official tutorial with a detailed explanation of actual code from an actual app available on the store. Completely standalone C apps that do not require any connection to the Internet or any configurable settings in the Pebble phone app. Note: Because all the processing for a Pebble.js app is done on the phone, there can be a noticeable lag in UI elements, input and output in many cases. Also, since your app is constantly communicating with the phone for pretty much everything, it can drain more power. Besides this, the app will not function when the user is away from their phone. Pebble.js won’t replace C apps in its current state, but that does not mean you should not use it. Pebble.js is easier to use than the C SDK for apps that connect to the Internet for all or most of their functionality, like my app: AppHookup. 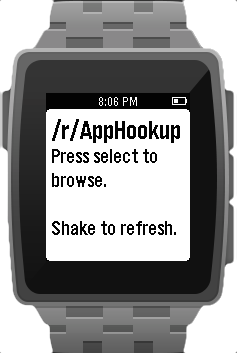 AppHookup is the official Pebble app for the /r/AppHookup subreddit, a place where people contribute app deals and discounts on all platforms. It queries the reddit API for the last 35 posts on the subreddit and displays them in an easily-readable fashion. Pebble.js apps cannot function without a phone nearby. However, AppHookup cannot function without an Internet connection by design, so the user is not expected to use it without a phone around. Thus, Pebble.js’s biggest restriction does not apply to this particular app. Let’s look into what the Pebble.js API provides you with. Then I will give you an overview of my AppHookup app. The official Pebble.js documentation covers all of the components of the SDK very well, but it is only generic documentation and there are few Pebble.js tutorials out there. In this post, I just aim to give you a basic overview that should be helpful if you’re just getting started. To write a Pebble.js app, go to CloudPebble, an amazing cloud-based IDE for writing Pebble apps. With it, there is no need to install anything on your computer. You can just write your code, hit the run button and the app is compiled and run on your watch pretty much instantly through your phone. The editor itself is great and it integrates with GitHub as well. Just like CommonJS or Node.js, Pebble.js allows us to require dependencies. So you can have a multi-file layout and have files include others as dependencies. Pebble.js comes with several Window types built in and ready to use. This means that you can have scrollable/non-scrollable cards, menus and dynamic windows in your app without coding the underlying architecture for them. This is one of the smaller benefits of using Pebble.js over the regular SDK. For basic apps, there is no UI work required. Card is just what it sounds like. It’s a pre-built, simple Window that displays a title, subtitle and body that you supply to it. It can be set to scrollable optionally, and it resizes/cuts-off the text accordingly. Menu is a scrollable list of items. 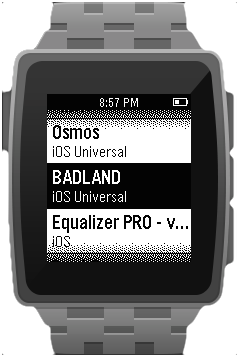 It is very similar to the main menu in your Pebble. You can have a title, a subtitle and optionally, an icon for each item. Window is a perhaps confusingly-named element. But it is exactly what it’s called. It’s a generic window and likely a parent of the other two. Just like with the C SDK, you can set go nuts with the design, placing Elements (shapes, text, images) exactly as you want them to appear on it. Note: Card and Menu are pre-designed Window elements, so you cannot set custom fonts or text sizes for them. Just like UI elements, there is an ajax module. It allows HTTP requests (GET, POST etc. ), downloading JSON data and has optional async support. The documentation has sample code for it. You can also skip ahead in this article to see how I used it with reddit. Get raw data and parse manually using various functions. Detect taps/shakes. This one is done automatically and reported to your app if you expect it. (Hard) Taps are considered to be the same thing as a quick flick of the wrist. Tip: Use the tap/shake API to add refresh functionality in your app! Vibrations (Vibe module) are a great way to give feedback to the user to notify them of the completion of a task, like when new data is downloaded. 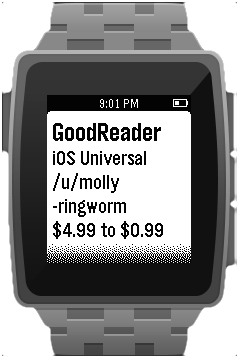 You can find all of this code and more in context at the AppHookup for Pebble GitHub repo. Note: Some of the snippets in this post are adapted versions of the actual source code to make them easier to understand with less context. body: "Press select to browse.\n\nShake to refresh." This is pretty much the entry point to the application. I make a new UI.Card element with a preset title and body. This automatically generates a card with the appropriate fonts. With just these lines of code, we have a fully functioning app with one title screen. Next, I add a listener for the ‘select’ button on a menu item. Then I read data back from the previously created JS objects, which the UI.Menu exposes. Each app gets its own UI.Card (with preset titles and bodies) when it is clicked on. Check out the parseApps function, which returns an array of JS objects to pass into UI.Menu. I use the replace function as a quick and dirty way of unescaping some of the common HTML characters in AppHookup posts. If anybody knows of a better way to do it, please post it in the comments. splitTitle is a function that uses regular expressions to parse AppHookup post titles. The regex was contributed by Thanasis Grammatopoulos from Stack Overflow. You can check it out in the app’s source, linked above. After doing a bit of string manipulation to make corner-case stuff look pretty, I add a JS object to the array I shall be returning. Take note of the format. This is the array that is passed into the UI.Menu constructor. Now here’s a final tidbit - basic accelerometer usage. It is possible to get full accelerometer data through Pebble.js, but interpreting this data is very involved because the data points are raw values of 3D movement on the x, y and z axes. We won’t delve into that in this article. Once you have built your first app, the process of publishing it is very straightforward. Simply get the .pbw file from CloudPebble, capture a few screenshots, make some store graphics and fill out a form on Pebble’s dev portal. The requirements can be found on the site. This meant that before I could download my app from the Pebble app store, I had to wait for a few weeks for an update for the Pebble mobile app to show up. There’s no getting around it. Just hope that your app’s release matches the time when the latest Pebble app update is sent to Apple for approval. This is done specifically for app releases every couple of weeks to a month. Now you have a basic overview of the Pebble.js SDK. Delve into the official documentation, hit CloudPebble and start hacking away on your smartwatch app idea! If you ended up finding this post useful - or better yet, made an app after reading this post - let me know in the comments! I would be delighted to read about your experiences. Good luck, and go design some cool stuff.